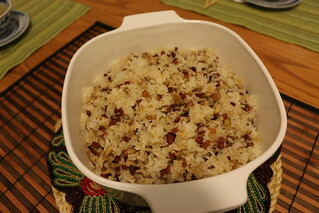 There are many ways of cooking this type of rice/ dish. We call it ‘lap mei fan‘ (in Cantonese). 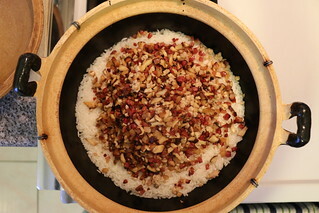 The main ingredients include ‘Chinese’ rice, glutinous rice, preserved duck leg, Chinese sausage, Chinese cured meat, dried shrimp, Chinese mushrooms, minced pork or chicken and kohlrabi. 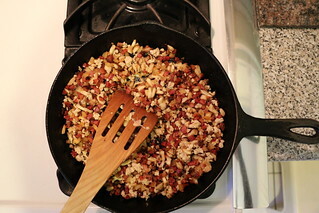 Soak the dried shrimp and mushrooms ahead of time. Presteps, dice the preserved duck leg, Chinese sausage cured meat (with fat), shrimp, mushrooms and kohlrabi into small cubes. 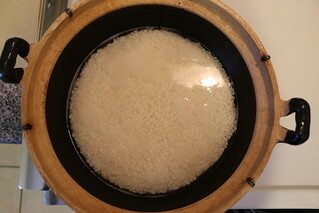 Wash and soak even amounts of both rices. 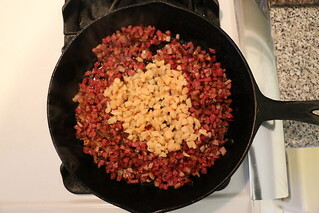 Step 1: Without any oil or butter, cook diced duck leg, sausage and cured meat in a pan. 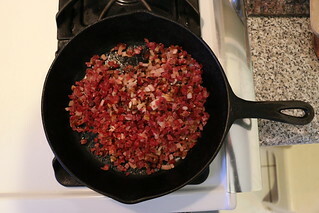 The fat from the sausage and cured meat will seep out and the meats will be fried. 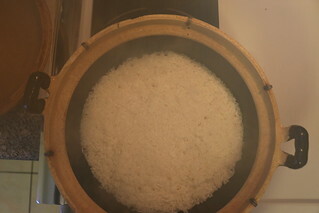 Step 2: While the meat is cooking, cook the rice in a big pot (preferably clay). Step 3: Add the shrimp with the meat and stir and cook. 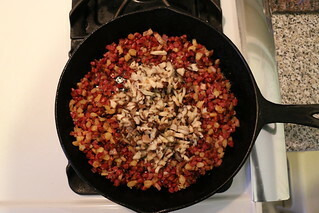 Step 4: Add the chopped mushrooms and cook. Step 5: Add the minced meat and stir till cooked. Make sure all the ingredients are well mixed and cooked through. And put side. 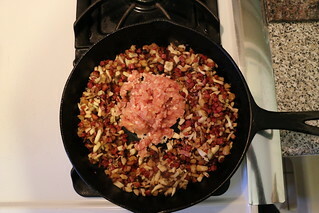 Step 6: In the mean tine, without washing the used pan, cook the kohlrabi until tender. Leave aside until rice is cooked. The rice is almost done. 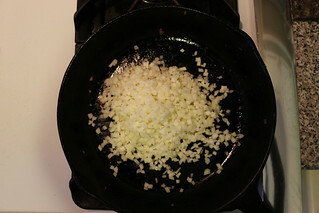 Step 7: When the rice is cooked through, add all the cooked ingredients from the pan and mix well. Step 8: After mixing, add soy sauce to your tasting. 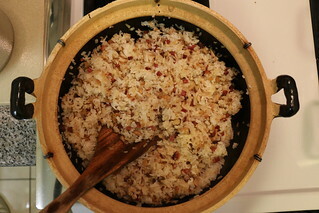 The sauce also adds colour to the rice. Again, mix well. TADA! This makes plently for dinner (for 4 people) and there are plently of leftovers for lunch for the next day. ENJOY : ) ! P.S. If you’re feeling unbalanced and need some green or vegetables, steam some Chinese vegetables. My mom always makes a bowl of veggies when our family has this for dinner.